The LG STB-3000 gives you a high quality option at a low price point. The LG STB-3000 provides a unique and dedicated hotel application platform for hosting interactive applications, enabling delivery for a wide range of custom applications tailored to both hotel management and guest needs. 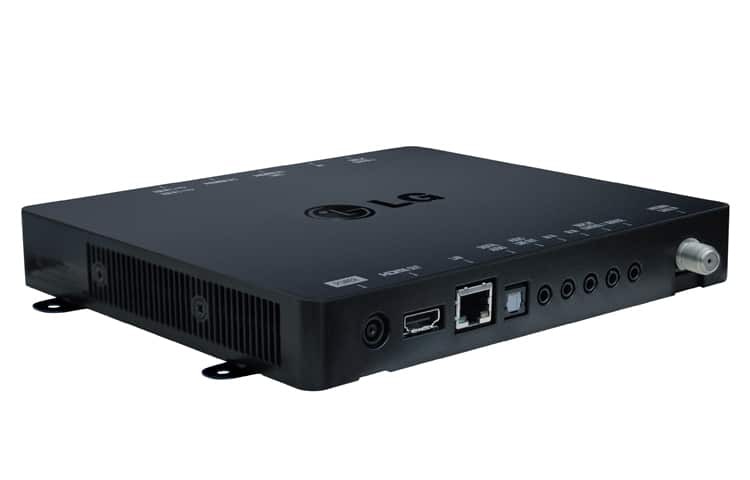 The LG STB-3000 is a full IPTV platform with built-in IP video decoding, supporting both IP and RF connectivity. The LG STB-3000 supports embedded Wi-Fi for streaming of content to the television or back channel communications. The LG STB-3000 also features remote diagnostic tools for partners to manage their systems and monitor the STB’s on the network by the head-end or cloud-based server for maintenance and admin purposes. The LG STB-3000 supports “second screen” sharing and options includes Wi-Di™, Wi-Fi Direct™ and Smart Mirroring technologies, which are used to pair guests’ mobile devices with the STB enabling them to share and view their content on the large HD screen. Java and Flash programs to provide premium hotel services. The USB Cloning feature allows you to simply copy the STB’s settings onto all STB’s using a USB stick, a process that is fully automated to save time without having to set each STB one by one. Using LG’s optional Pro:Centric server, you can remotely manage cloning and channel mapping for STB’s in guest rooms without having to visit each room. The STB-3000 provides a unique and dedicated hotel application platform for hosting LG’s SI (System Integrator) Partners interactive applications, enabling delivery for a wide range of custom applications tailored to both hotel management and guest needs. The STB-3000 is a full IPTV platform with built-in IP video decoding supporting both IP and RF connectivity. Leveraging the Pro:Centric IPTV platform enables SI Partners to integrate their client software directly into the STB to enable control of content on LG and other manufacturers commercial televisions. The STB-3000 supports embedded Wi-Fi for streaming of content to the Television or back channel communications. based server for maintenance and admin purposes. interactive electronic program guide and digital billboards to view information on the property’s amenities.